Are you one of those who want to make money online and work from home to pay your bills? Are you earning passive income online? I the answer of these questions is a yes, then you are the one who is going to his life from here! Now a days working from home online become lifestyle and there are millions of people who desire to make money online. The best thing about making money online is that numerous people are making a living with online income sources. If you know anything about making money online, then you must have heard of Adsense. Today I am going to share a complete guide to help newbies like you, who want to make money online via Adsense and work from home. At the end of this guide you will have all the required information that will help you to start with making money online. So let`s learn how you can make money from AdSense from Home by working online. What is Google AdSense and how you can make money with Adsense? Google AdSense is a most popular contextual ad service which is absolutely free and offered by Google for its publishers who want to monetize their online content. A publisher can be anyone who has Youtube channel, Website, blog or anything. AdSense has always been most popular among bloggers, webmasters and tune channels to monetize their online content. AdSense is popular because it is interactive to use and just need basic configuration. After that you just need to relax and see money coming into your bank account from Google. The best thing which I like about Adsense is that they always pay on time. It is really easy to start with Google AdSense. You just need a website, youtube channel or a blog to apply for Adsense and get approval for your AdSense account. All you need to do is get Adsense Approval and then create ads and place those ads on your blog or website, it will make Adsense ads automatically show on your blog or website. Now, If any user clicks on those ads, you will get paid. After that all you need to do is get more and more traffic to our website. Tip/warning: If you are thinking to make your friends or family to click on ads, I warn you never do it. Google AdSense is strict about maintaining the quality of ad network which makes it most popular ad network. Any kind of misbehave on ads will cost disabled AdSense account. Once your account is disabled, you will never be able to get it back. The very basic question that every newbie blogger ask while looking at Adsense is that how much he/she can earn. believe me there are people who are making more than $50,000per month, you can even look for them on Google. about these how you can get Adsense and make money on these web properties. In the beginning you can start without paying anything. So start with Blogspot. Domain name: BlogSpot always offers a domain name fox example thisismyblog.blogspot.com.I recommend you to choose easy name which you can remember easily. Niche: Start posting articles in one particular topic. Design: You can use free template or you can also use premium blogger templates from here which are also free. Pages and Posts: Pages are for important pages and Posts are for writing articles. I always recommend you to create blog on WordPress and I have already shared why you should create blog on Wordpress self hosted platform. Here you need to get your domain name and hosting, which is really exciting as it gives you more control over your website or blog. Read: How to buy domain & hosting for WordPress blog. Here are resources that you can refer to create your WordPress blog. This is also a popular way to monetize your video content with Adsense. Not everyone like writing, and many people only like videos. If you are good at recording videos, then it can be helpful for you to make money by uploading those videos on YouTube. Create an Account on YouTube. Start uploading original videos. You can easily create screencast videos. Constantly upload 5-10 to be eligible for making money from Adsense. Web property checked- What Next? Once you have one of any of above properties or both then you are ready to Apply for adsense. If you are working seriously on web property with commitment only then you can get Adsense account. You should have patience and dedication to make money from Adsense. Now as you are ready for submitting AdSense application. Here are guides/tutorials to help you to get AdSense approval. It may take around 7 days to get approval from Adsense. Even if your site don`t get approved, don`t worry just fix where your site is lacking and apply again. Google Adsense only need valuable publishers. AdSense approved: What to do next? Now as you start making money from Adsense, your focus should be on boosting revenue from Adsense. For this you need to increase traffic as more traffic help you make more money. Also learn AdSense optimization tips such as Adsense Heatmap for Ad placement and high CPC Keywords. ONow you should create niche based sites to make more targeted traffic and make more money. I hope I have answered all of the questions related to making money online from Google Adsense. or You can refer Adsense guide for all tips. Feel free to ask any question via comments. 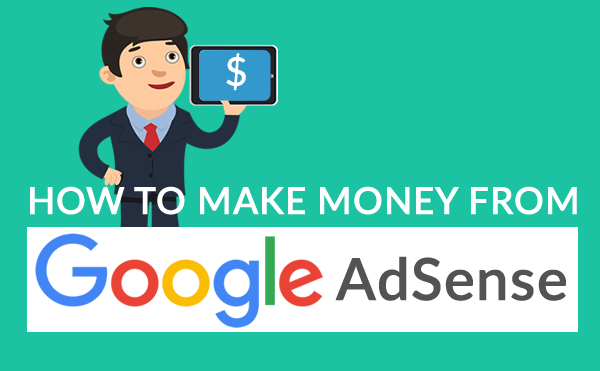 If you find how to make money from Google Adsense newbie guide helpful, don`t forget to share it on Twitter and Google Plus Twitter. Don`t forget to subscribe eAskme newsletter to stay tuned with us.